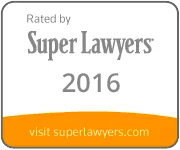 Super Lawyers has recognized shareholder Damien Holcomb and associate Shawn Ogle as 2016 “Rising Stars”. This is the third consecutive year that Holcomb has achieved the “Rising Stars” honor. The “Rising Stars” designation recognizes no more that 2.5 % of attorneys in each state who are 40 years old or younger, or in practice for 10 years or less.